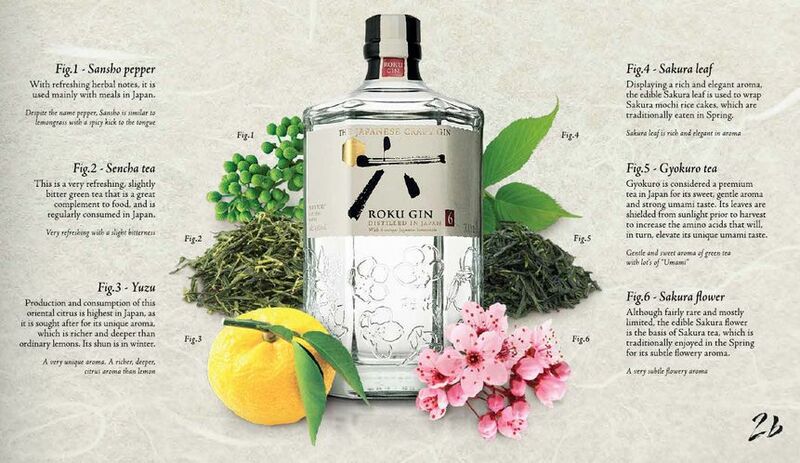 Beam Suntory, whose brands include Jim Beam bourbon and Laphroaig Scotch whisky, reckons drinkers in Europe are ready for a new tipple: Japanese gin made with cherry blossom and other exotic ingredients. 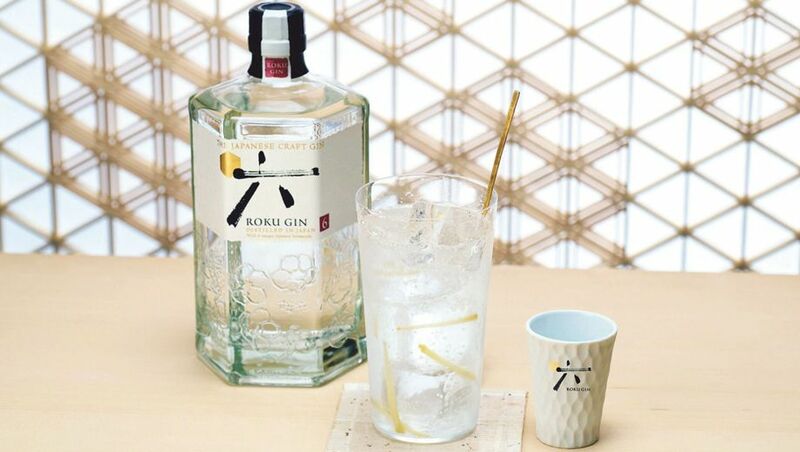 Roku, a premium gin made using six distinctly Japanese botanicals, has entered the U.K. market at £30 (A$54) a bottle at popular grocery chain Waitrose. It’s also available in more than 50 bars in London, Manchester, Liverpool, Glasgow and Edinburgh, with plans for expansion across the U.K., which is going mad for gin. “We wanted to make something that was unusual but not strange,” Torii explained as we tasted five different types of gin, before he presented the signature Roku gin & tonic, which is served with ice and six hand-cut slivers of fresh ginger. Roku, which means six in Japanese, is distilled in Osaka. It is made with Sakura flower, sakura leaf, yuzu peel, sencha tea, gyokuro tea and sansho pepper, for a spicy finish. Each Japanese botanical has been harvested in accordance with the concept of shun, which means they are only harvested at peak flavor. The hexagonal bottles feature one of the botanicals on each facet. The label is printed on traditional Japanese washi paper. And the flavor? Roku is dangerously light and smooth, smelling of citrus with a hint of spice. There are eight traditional botanicals in the mix, too: juniper berries, coriander, angelica root, angelica seed, cardamom, cinnamon, bitter orange peel, lemon peel. Suntory is hoping to build on the success of Japanese whiskies in the U.K., where brands such as Suntory Hibiki, Hakushu and Yamazaki are finding favor in the home of Scotch. Suntory traces its history to 1899, when founder Shinjiro Torii started producing sweet wines. The company started making whisky in 1923 and produced its first gin in 1936. It was possible to get hold of Roku before now, if you were willing to pay more than £60 a bottle. But Tuesday’s launch represents a new focus on the U.K. market. It’s not difficult to see why the U.K. would attract competition from overseas. Gin’s popularity is surging: U.K. sales doubled in the last six years, according to the London-based Wine and Spirit Trade Association. Consumers bought more than 47 million bottles in the 12 months to September, up from 40 million a year earlier, the association said. A YouGov poll last year found that gin was the most popular spirit in the U.K., with 29% of drinkers selecting it as their favorite. Gin jumped from third place a year earlier, overtaking whisky (25%) and vodka (23%). Roku is made by a unique process using four distinct types of pot stills, where the botanicals are distilled separately to extract the best flavor and maintain their individual characteristics. For instance, the scent of cherry blossom is drawn out through vacuum distillation in stainless steel pot stills, whereas the deep flavor of yuzu is achieved in copper pot stills, Torii said. Comment on "Review: Roku is a premium gin crafted from six Japanese botanicals"